The Memphis Grizzlies will be duking it out with a handful of hopefuls for one of the last playoff spots in the West. The contributions of their second unit will be critical down the stretch if they are going to make their first postseason appearance in four years. Backup power forward Darrell Arthur was originally drafted by the New Orleans Hornets with the 27th overall pick in the first round of the 2008 NBA Draft on the heels of winning the 2008 NCAA National Championship as a member of the Kansas Jayhawks. But his rights were traded three times on draft night before he eventually landed in Memphis. Arthur missed half of his sophomore season due to a partially torn pectoral muscle. But he made a full recovery and, now in his third stint with Memphis, is having the best season of his young pro career. Arthur’s offensive game has been slowly developing, and he’s proven to be a steady producer and a solid contributor off the Memphis bench. Arthur is the Grizzlies’ leading reserve, averaging the most points (8.1 ppg) and minutes (20.1). I see growth in his offensive game every time he comes on the court. And he’ll also grab 3-4 rebounds each game. 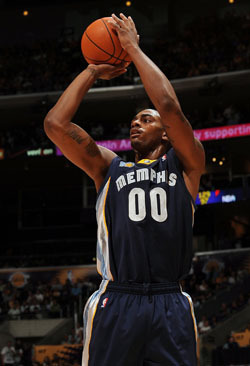 Darrell Arthur scored 10 points and 17 points in last week’s wins over Detroit and Dallas. The Memphis Grizzlies are looking to improve upon their near .500 record and will be tested in four games this week. Arthur is available in most fantasy leagues.